Jet Airways now flies only 41 of the 119 aircraft it had before the crisis, the aviation ministry said on Tuesday. 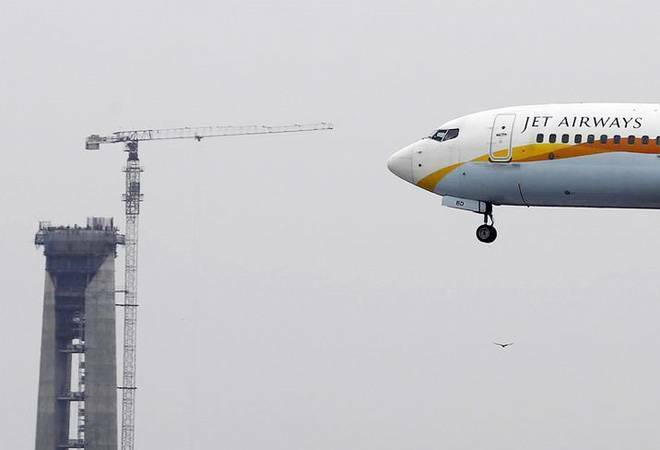 In the early trading session on Friday, the shares of Jet Airways rose almost 3 percent, a trend reversal after two days of consecutive fall amid reports that SBI-led consortium of lenders is set to reinitiate talks with Tata Group to invest in the ailing carrier. It outperformed the airline sector by 1.23 per cent and touched an intraday high of Rs. 225, a 3.6 per cent jump against the previous close of Rs.218 on BSE. Similarly, on NSE, it rose 3.4% to today's high of Rs. 226. Today, the stock is trading at a volume of 5.5 lakh on BSE and 50 lakh on NSE, respectively. At a volume-weighted average price (VWAP) of Rs. 223, the price band for the day quoted between Rs.240 to Rs.196 on both the exchanges. With Etihad Airways looking to exit the beleaguered Jet Airways, lenders are set to re-initiate talks with the Tata Group as a possible new investor in the Indian airline. Tatas, who were keen to buy the airline and were in preliminary talks with Jet in November , have already been approached by the lenders and a formal offer is likely to be sent soon, said media reports citing top sources. The recent developments on the country's biggest cash-strapped airline involve steps such as change in its existing management (Naresh Goyal, his wife Anita, and two nominee directors, Nasim Zaidi and Gaurang Shetty have been asked to leave the boar d ) and SBI's commitment to the revival of Jet Airways, with Etihad expressing a wish to sell its stake in the airline. In fact, Abu Dhabi-based airline Etihad has offered to sell its 24% stake at a loss . A spokesperson for Etihad said that the airline "is working closely with Indian lenders, the company and key stakeholders to facilitate a solution for Jet Airways". Jet Airways on Thursday approved a bailout plan that would allow its domestic lenders, led by State Bank of India (SBI), to convert their loans into equity under the Bank Led Provisional Resolution Plan (BLPRP), making them the largest shareholders of the cash-strapped airline. Etihad Airways' CEO Tony Douglas also met SBI chairman Rajnish Kumar in Mumbai on March 18 to discuss Jet Airways' bailout plan . He has further asked SBI to buy Etihad's 24 per cent stake at Rs 150 per share, or about Rs 400 crore for the full stake. Jet Airways is facing tough times with passengers demanding refunds on account of several flight cancellations and pilots threatening strike over unpaid salaries. The airline now flies only 41 of the 119 aircraft it had before the crisis, the aviation ministry said on Tuesday. The stock not only trades lower than 5, 20, 50, 100 and 200-days moving average, but also has fallen over 65 per cent in one-year's term. Jet Airways share price has been performing inconsistently on the back of escalated grounding of leased aircraft and restructural haggling between Etihad and SBI-major lender. On the contrary, its biggest competitors are on a consecutive rise after the negative media reports on the 25-year old airline. Today, the share price of Inter-Globe Aviation Ltd and Spicejet Ltd 's quoted 2.12 per cent and 14.24 per cent hike respectively. Inter-Globe Aviation's share price touched an intraday high of Rs 1,453 today, that is 67 points away from its 52-week high. It has been consecutively gaining for the last 4 days and has risen 10.23 per cent in the period. In the meanwhile, SpiceJet opened today rising 2 per cent above the previous close Rs 91.65 and scored an intra-day high of Rs 104.70 at a total traded quantity of 95 lakh on BSE (above 5,10,30-day average volume). It lists among the top volume gainers with a turnover of Rs 96.83 cr at an 4.88 per cent volume change and also lists number one gainer in the BSE. It has been consecutively rising for the last 4 days and has risen 26.51 per cent during the period.